Prince Harry has pledged to facilitate the movement of between 500-1000 Elephants from Botswana into the Kafue National Park that has a culling capacity of close to 25 thousand elephants. 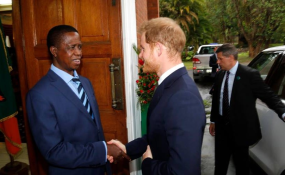 This is according to State House Spokesman Amos Chanda who briefed the media following a closed door meeting between President Edgar Lungu and the Prince at State House today. Chanda said the animals will be moved under the African Parks where Prince Harry is the Chairman of the organization. African Parks operates the Liuwa National Parks in Western Province and also the Bwangweulu Swamps in Luapula province. Chanda added that the gesture is likely to boost tourism in the National Park with the introduction of increased numbers of Elephants in the Park. "He sees great potential in the Kafue National which he considers as the best national parks in the World". From 15 animals in one park there can be over 15 thousand animals within a decade or so" Chanda explained.